Now Make Your Move. Strategy Is Everything, In Shopping As In Life. Photographs by Fab Fernandez; Styling by Neil Cohen; Hair & Makeup by Chelsea Dorris. 1946 The year Cliff Henderson purchased 1,700 acres of sand and began to develop a grand avenue studded with palm trees. His mind's eye envisioned an elegant Southern California destination like no other, drenched in sunshine and dressed in sophistication. His dream lives on in the designer shopping and resort lifestyle district we enjoy today. Elbe wears an Parker Smith 0039 Italy tunic shirt, white jeans, and Seychilles slide sandals, BB.one; Balenciaga bag, Saks Fifth Avenue Palm Desert; vintage sunglasses, Candice Held; earrings, Trina Turk. Chris wears a T-shirt, Vince; J Brand Jeans, Saks Fifth Avenue Palm Desert; Anderson's belt, Mr Turk; Noah Waxman Greenwich sneaker, noahwaxman.com; Persol sunglasses, Saks Fifth Avenue Palm Desert and carries a duffel, Tumi. In trunk: Kempton & Co. tote, BB.one. Chic on arrival. 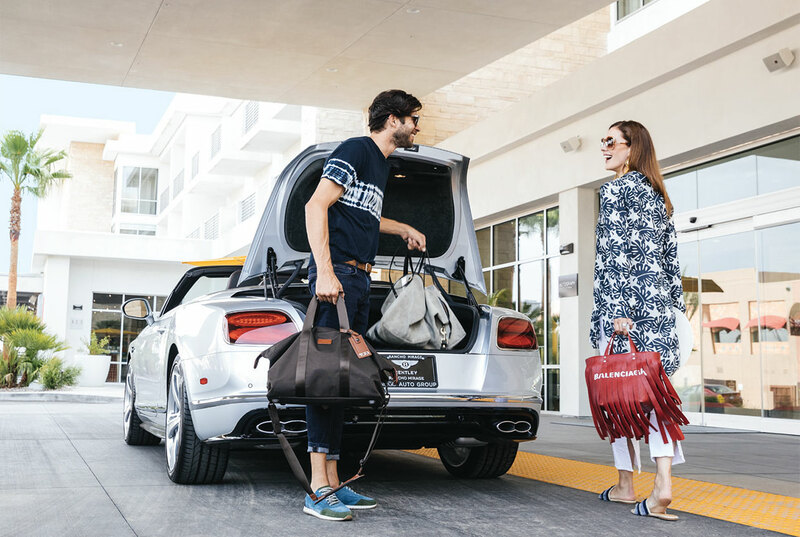 Pulling up to Hotel Paseo in a Bentley Continental GT V8 S Convertible from indiGO Auto Group in Rancho Mirage embodies the spirit of relaxed refinement. This scenic mile-long esplanade leaves the choice to you. Stroll along and see where the day takes you or step aboard a yellow Courtesy Cart. The free, open-air shuttle travels the length of the El Paseo shopping and dining district so you don't have to. Retailers on El Paseo set their own hours, yet the vast majority open at 10 a.m. Designer clothing stores and boutiques generally close at 6 p.m., though several specialty stores keep later hours. (The Apple Store geniuses answer tech questions until 7 p.m., and shoppers can browse Saks Fifth Avenue until 7 p.m. Thursday to Saturday.) A number of stores maintain limited hours during the summer season; a few close to refresh and restock. It's always a safe bet to call ahead. Two hallmark annual events share back-to-back dates in March making it effortless for culture hounds to attend both. Fashion Week El Paseo electrifies the evolving style scene with eight heart-pounding nights of runway shows produced by iconic designers and emerging talent. Palm Desert Food & Wine curates personal experiences around top chefs, innovative cuisine, and paired libations. Together they are an event power couple. Plan your year on El Paseo, starting on p. 36. True. But El Paseo would never ask you to watch the clock. Happy hours on these convivial blocks kick off as early as 11:30 a.m. When you polish off your morning mimosa or bloody mary, see p. 64 for our list of next stops. 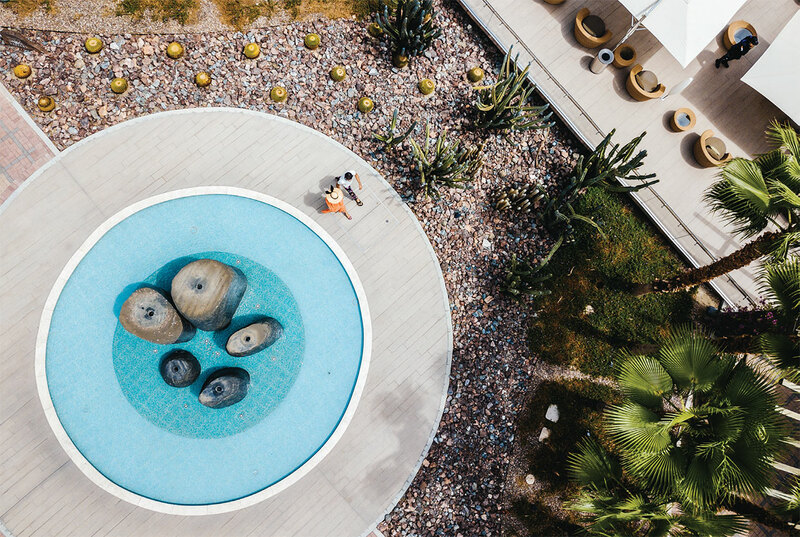 When Hotel Paseo opened in 2018, devotees of this stylish boulevard seized the opportunity to stretch out their time and stay awhile longer. Retail therapy can now span several days, dotted with pool time, spa therapies, and posh rooms with a view. Within several miles, theater, golf, museums, hiking, and a zoo expand your possibilities. See p. 70 for more on the hotel's amenities and p. 74 on tips and ideas for a Palm Desert getaway. — Keep four-legged friends on a leash at all times. 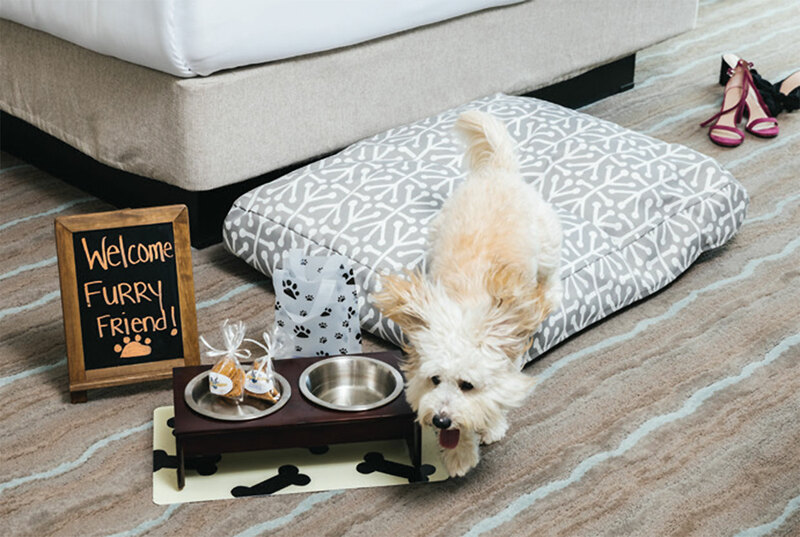 — Pick up after your pooch. — Ask stores before entering. Our round-up of eateries with pet-friendly patios can be found in "Where El Paseo Eats."